Johan Evers has a passion for preservation – find out how he’s pushing the boundaries right here. 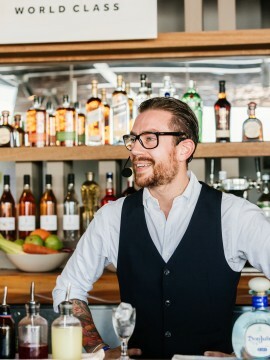 Johan Evers hit the heights in the 2016 World Class Global Finals, reaching the final 12 and representing Sweden at the bartending top table. Now, as owner of new Stockholm bar and restaurant Penny & Bill, along with chef Henrik Norström, Johan has found a new passion: preservation. Whatever the ingredient – if it’s good enough, he’ll keep it. Here, Johan explains why making cocktails to last is the future, and how World Class started it all. Well, if you don’t preserve things they’re going to die – that’s Mother Nature. It’s why we work with rotten apples. We have beautiful farms all across Sweden with so many apples. They’re literally everywhere, so we don’t need to pay for them – we just take a bag to a farm and pick a whole load up. When an apple falls from the tree it’s basically saying it’s ready to eat, but after a certain time that apple starts going bad, which is such a waste. So, what can we do to revive it? This is very interesting: you get a slightly fermented flavour, but that’s okay – you can do something with it. We create a jam first, then that goes into a vacuum with some liquid. Next, it’s double preserved with alcohol. We can combine this with allspice, plus a measure of gin, and then you have a Preserved Apple Gimlet. How do guests respond to rotten apples in their drinks? We ask them if they’ve ever had kimchi, which is basically fermented old cabbage. We show how it’s pretty much the same, but with apples, and they kind of accept what we’re doing! We have a story to tell and – after some persuasion – people love it. Of course, an apple can be completely rotten and impossible to rescue, but we do what we can. Is the preserved flavour radically different, then? It’s not the same as picking it off the plant and putting it in your mouth. But take cloudberries – the local fruit that we call Nordic gold – that sweet and sour, riesling wine flavour with the raspberry texture can all be preserved, just with a little more of an oily texture and a slightly jammier taste. So, preserving will change the essence, but can still come close to the original flavour. Where did you find the best ways to preserve? We talked with our mums – honestly! We don’t need Google and we don’t need super technology or lots of machines. My mother was taught how to preserve when she was little. I don’t know how long we’ve been doing it in the Nordics because nothing grows here for six months – it’s that cold. Pickling in vinegar is the most traditional way, and we can replace or supplement the vinegar with alcohol, which is perfect for us. The problem here isn’t knowledge, it’s the way the world works. So, instead of creating things for ourselves we’re like ‘let’s just hit the supermarket’. Everything needs to be done about three times faster – go grab a ready meal and you’re done. What else are you preserving? What made you think about preserving in the first place? It was actually brought on by competing in World Class. The challenge around ‘Future Drinking’ in Miami [in 2016] really made me think about my future as a bartender, and the future of bartending in Scandinavia. I was wondering about the shape of cocktails to come and something switched on in my head – suddenly what I needed to do was so clear. In the challenge I used powdered red pepper – drying is a wonderful preservation method – roasting them with a touch of habanero and then making them into powder. This went into a cocktail with Johnnie Walker Black Label Scotch Whisky and Don Julio tequila, plus Oloroso sherry and a few dashes of vinegar. I scored highly because I really believed in this one. Is preservation something of a growing trend? Is persuading guests to try these flavours a tough ask? We’re not going to showcase techniques with 200 guests on a Friday night. What worked really well was when I came back from World Class and opened a pop-up bar at a suite in a hotel with two sittings every night. It helped me decide what to put on the menu at our new venture, Penny & Bill. 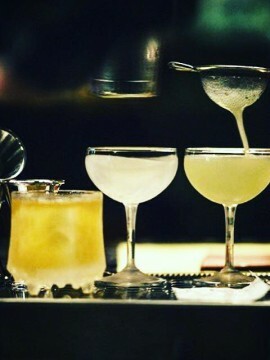 Cocktails need to work in the real world as well as on paper, and with fewer guests you can really push the limits by talking to them, creating an experience and getting folks to understand that what you’re doing is something really different. Have you ever thought about getting rid of limes and lemons? I love the idea of not using citrus, but there’s a reason why only one bar in the world has ditched them. If we took limes and lemons out of our drinks, we wouldn’t have any customers left. White Lyan is such cool place, but it’s in London where there are almost as many people as in the whole of Sweden. I’m definitely putting on a drink or two that won’t have fresh ingredients at Penny & Bill, and in a couple of years we could have a lot more – we’ll keep preserving, because that’s the future.